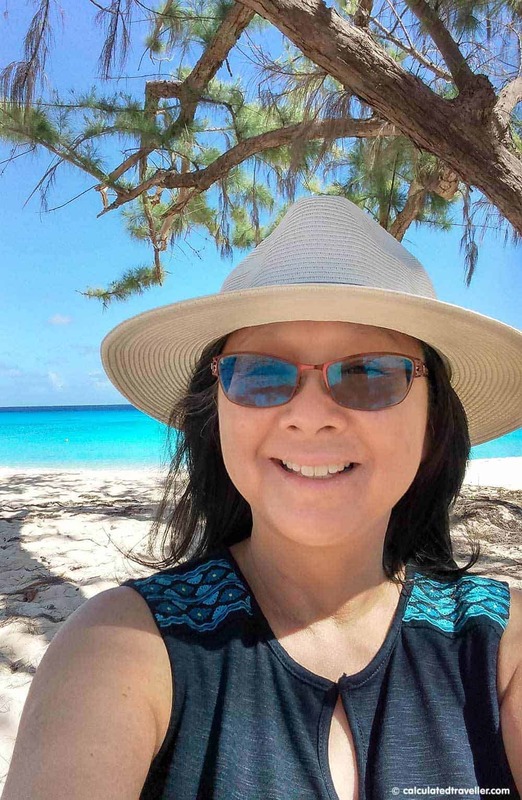 A hat is always on my sun-protection packing list along with the obvious sunscreen and the Havana Hat by Sunday Afternoons was my stylish hat of choice on my most recent trip to the Caribbean and Florida. I’d never heard of Sunday Afternoons hats before until they reached out with an opportunity to try one on for size. I was happy to learn upon further investigation that Sunday Afternoons has been around for more than 25 years — a vital fact when considering a premium product such as this one that boasts a lifetime warranty. Since we had a trip planned to escape the cold Canadian winter for the warmer, sunnier temperatures of the South, it was the perfect time to give a hat by Sunday Afternoons a try. I love that it’s stylish. My usual go-to hat when travelling to the beach is a favourite ball cap or bucket hat; both practical and functional choices, but stylish? Not so much. The Sunday Afternoons Havana Hat comes in Cream and Tan colours with a black grosgrain ribbon detail. 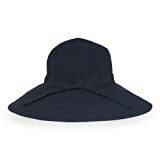 It’s much more stylish than my usual favourites, and the fedora style of the hat looks great when worn at the beach with your bathing suit, but it also fits right in when touring the town or when wearing a sundress. This hat is not just for women — It’s unisex so, in a pinch, husband Ray could wear it. Sun protection accessories like sunglasses and sun protective clothing with built-in SPF is a must! 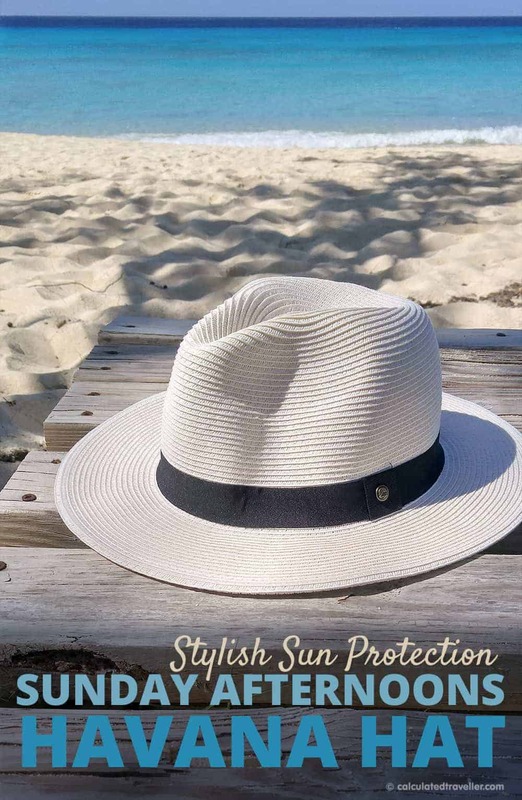 The hat measures 13x13x5 inches and the 2.5-inch wide brim shields the eyes and protects with the highest sun protection rating available at UPF 50+. The straw weave keeps you cool and makes the hat breathable. My absolute favourite feature about the Havana Hat is that it is sized – small, medium, large, extra large but it also has extra adjustments to fine tune for comfort with Velcro along the inside of the moisture wicking sweatband. The Havana hat doesn’t come with a cord to secure the hat to your head in case of windy conditions. Nor does it have a loop or anything inside the hat should you wish to clip the hat to your bag — something that I like do with a carabineer when I go swimming so that it doesn’t blow away with a sudden gust of wind. The Havana Hat is constructed of 90% Paper, 10% Polyester. It can withstand a minor rain shower, but it can’t be washed or soaked with water. 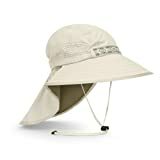 I was super excited to learn that my new sun hat packed for travel but was disappointed because I couldn’t find any instructions anywhere on how to pack it properly. No instructions on the tag or online — I didn’t want to ruin my hat by doing it incorrectly! In the end, I folded the hat in half making sure not to put a kink in the edge of the brim; I rolled it up in a cone shape and secured it with a loose elastic band. I stuck the “cone” in my backpack, and it survived without issue. The Fedora “dimples” also made it through without incident. I do prefer to pack my hat flat inside my suitcase versus rolling it. I think it would take up less room that way. So, please comment below if you have an alternate packing method! All in all, I wore my Havana Hat daily on a one-week Caribbean cruise and then another week in Florida. The hat was excellent and it even survived a few sudden Caribbean sun showers. The light colour made me nervous, and I worried that it would get dirty quickly but it does still look like new. 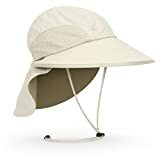 I’ll be including my Sunday Afternoons Havana Hat on my packing list for future trips when I need stylish sun protection gear at home and abroad. Sunday Afternoons manufactures products for the men, women and kids in your life. Order with Amazon online or check your local store – I saw that REI carried quite a selection of Sunday Afternoon hats. I was provided with the Havana Hat by Sunday Afternoons for review purposes and did not receive any additional financial compensation. All opinions are entirely my own. Looking for more Sunday Afternoons product review articles?